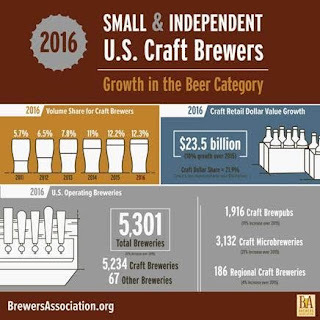 Boulder, CO • March 28, 2017—The Brewers Association (BA)—the trade association representing small and independent1 American craft brewers—today released 2016 data on U.S. craft brewing2 growth. With over 5,300 breweries operating during the year, small and independent craft brewers represent 12.3 percent market share by volume of the overall beer industry. In 2016, craft brewers produced 24.6 million barrels, and saw a 6 percent rise in volume3 on a comparable base and a 10 percent increase in retail dollar value. Retail dollar value was estimated at $23.5 billion, representing 21.9 percent market share. By adding 1.4 million barrels, craft brewer growth outpaced the 1.2 million barrels lost from the craft segment, based on purchases by large brewing companies. Microbreweries and brewpubs delivered 90 percent of the craft brewer growth. Additionally, in 2016 the number of operating breweries in the U.S. grew 16.6 percent, totaling 5,301 breweries, broken down as follows: 3,132 microbreweries, 1,916 brewpubs, 186 regional craft breweries and 67 large or otherwise non-craft brewers. Small and independent breweries account for 99 percent of the breweries in operation. Throughout the year, there were 826 new brewery openings and only 97 closings. Combined with already existing and established breweries and brewpubs, craft brewers provided nearly 129,000 jobs, an increase of almost 7,000 from the previous year. Note: Numbers are preliminary. For additional insights from Bart Watson, visit “Breaking Down the Craft Growth Numbers” on the Brewers Association website. A more extensive analysis will be released during the Craft Brewers Conference & BrewExpo America® in Washington, D.C. from April 10-13. The full 2016 industry analysis will be published in the May/June 2017 issue of The New Brewer, highlighting regional trends and production by individual breweries. 1An American craft brewer is small, independent and traditional. Small: Annual production of 6 million barrels of beer or less (approximately 3 percent of U.S. annual sales). Beer production is attributed to the rules of alternating proprietorships. Independent: Less than 25 percent of the craft brewery is owned or controlled (or equivalent economic interest) by an alcoholic beverage industry member that is not itself a craft brewer. Traditional: A brewer that has a majority of its total beverage alcohol volume in beers whose flavor derives from traditional or innovative brewing ingredients and their fermentation. Flavored malt beverages (FMBs) are not considered beers. 2Absolute figures reflect the dynamic craft brewer data set as specified by the craft brewer definition. Growth numbers are presented on a comparable base. For full methodology, see the Brewers Association website. 3 Volume by craft brewers represent total taxable production. The Brewers Association is the not-for-profit trade association dedicated to small and independent American brewers, their beers and the community of brewing enthusiasts. The Brewers Association (BA) represents more than 70 percent of the brewing industry, and its members make more than 99 percent of the beer brewed in the U.S. The BA organizes events including the World Beer CupSM, Great American Beer Festival®, Craft Brewers Conference & BrewExpo America®, SAVOR℠: An American Craft Beer & Food Experience, Homebrew Con, National Homebrew Competition and American Craft Beer Week®. The BA publishes The New Brewer magazine and its Brewers Publications division is the largest publisher of contemporary and relevant brewing literature for today’s craft brewers and homebrewers. Beer lovers are invited to learn more about the dynamic world of craft beer at CraftBeer.com and about homebrewing via the BA’s American Homebrewers Association and the free Brew Guru™ mobile app. Follow us on Facebook and Twitter.